“Carneval is the period between Epiphany, January 6th and Ash Wednesday, given to…. all kinds of rejoicing, and in particular one experiences the pleasures of the table….” according to “Larousse, Gastronomique”, an Encyclopedia of Food, Wine and Cookery. Carnevals are celebrated all over the world in all kinds of different ways, like masquerading to be someone one is not, or hiding behind a masque. This also is the time when one experiences the best and happiest moments with special meals while gathering and enjoying friends around the table. Every country enjoys it’s specialties and favorites during this time of celebration, and with it experiences the “last Hurra” before a somber, introverted and self-examining time that leads toward Easter. It actually was very much like a “mixer” in today’s world. One late Saturday afternoon in February we took off to the auditorium where the Fasching’s Ball was held. It was cold, snow had fallen all morning and we had to wear wool socks and heavy shoes, which of course did not go with our outfits, and we refused to wear coats, since the coats would crush our beautiful Fasching’s dresses. We decided to wear sweaters under our costumes, which made us look fat….horrors! We had all the teenage problems of self-consciousness and youth. But we overcame all our complaints, especially the freezing temperature by running most of the way to the “Kinder Fasching’s Ball” …to keep warm. This was my first experience of being in a huge room with hundreds of people. I was totally overwhelmed. It was dark and stuffy, people shouted, the music was blaring, and It was hard to stay with my friends. We kept being pushed apart and were constantly looking for each other. I finally got completely lost and found myself frightened and close to tears. Having been a person of quick decisions, even at that age, I found the door where we came in and left. I ran all the way home, in the dark, having been sickened by fright to the point of fainting. I had to, for the first time in my life, put all my strength together to put one foot in front of the other. I got home totally exhausted and collapsed into my mother’s arms. I never wanted to go to another Fasching’s Ball…..ever! The next Fasching’s Ball experience I had when I spent my year at the University of Tuebingen in Germany. It was given and held at the different Fraternity Houses. Needless to say this too was quite an… experience. However, I was an adult and knew that if I did not drink, I would survive the evening. I concentrated on checking out the buffet tables and explored the specialties of the chefs. These tables were much more interesting than all the “rejoicing” that was going on around me. A Krapfe is simply a doughnut without a hole. It originated in Vienna in 1615 and was created by Caecilie beim Peilertor, who was a “Luxusbaeckerin” a very creative pastry baker. 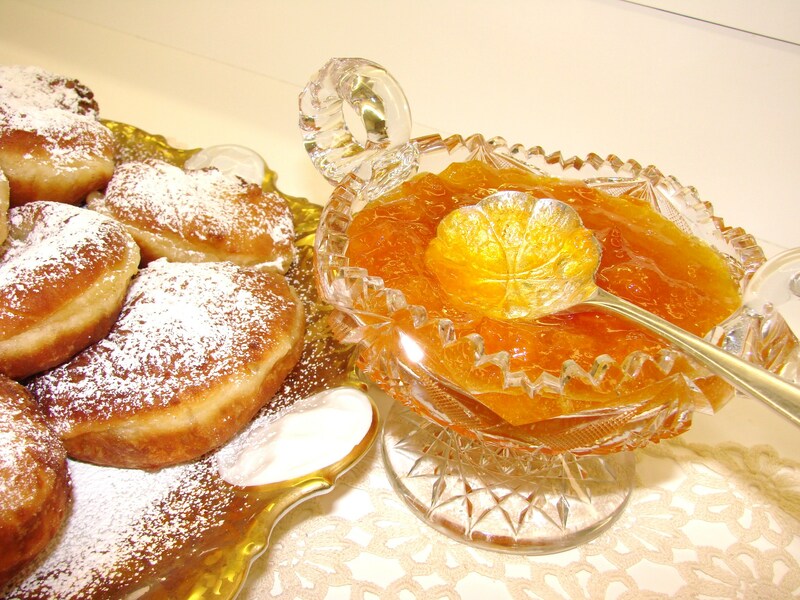 To honor her at that time these doughnuts were called “Cillikugeln” (Cilliballs) and 30 years later they and she were again honored with being filled or eaten with Apricot Jam. 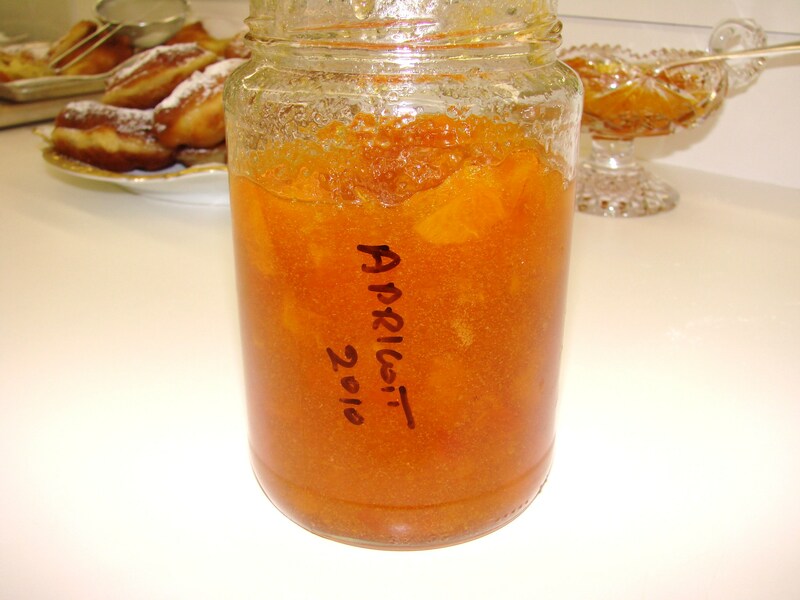 From then on Austrians cannot live without Apricot Jam! 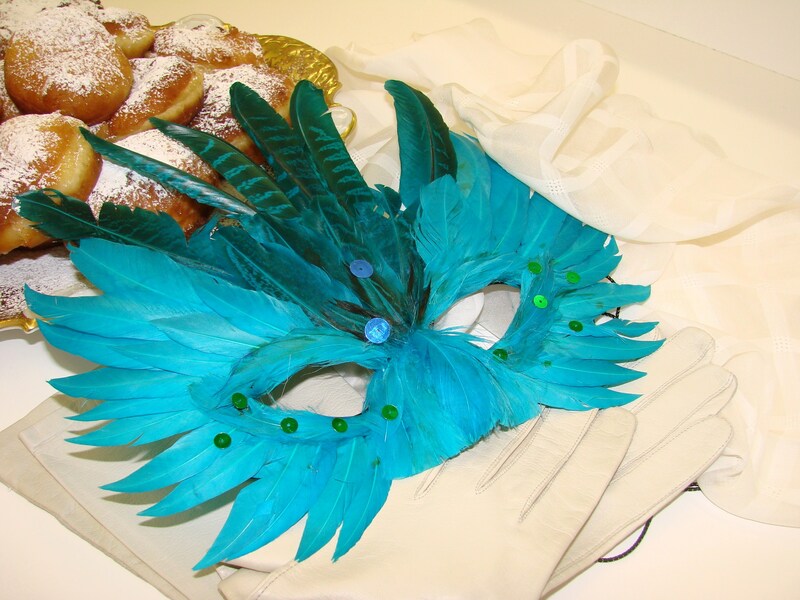 Have you ever been to a Fasching Ball ……… or a Carneval? Boy do those look yummy! Thanks Maria! Do you know, that I was born in the Lower-Rhine-Region, a heartland of these activities? Duesseldorf, Koeln, Moenchengladbach (where I lived until 1992) are towns where Karneval is called the “Fifth Season”. 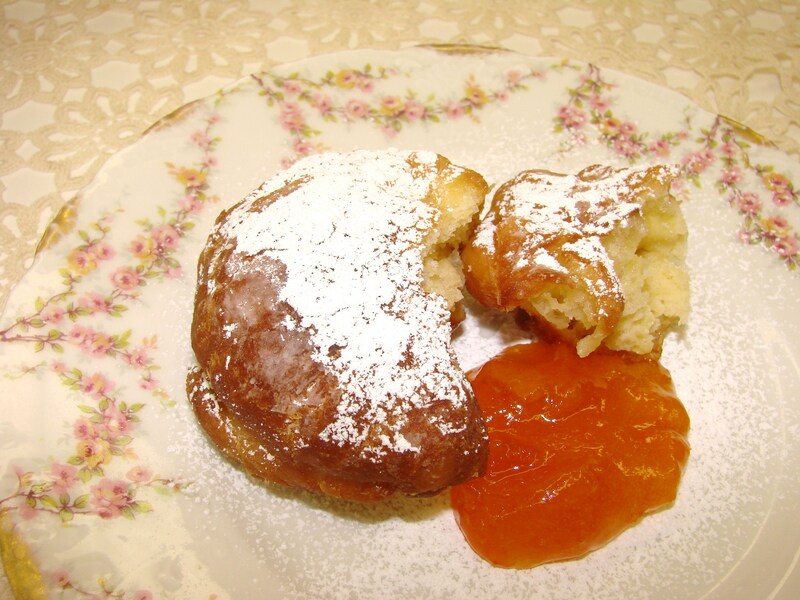 We fill our Krapfen with raspberry or strawberry jam. And sometimes, as a joke, with mustard (I did it some years ago – you should have seen my sister’s face…). Ohhhhhhhhhhh Jutta………I did not know that one plays tricks with Krapfen……like putting mustard into them……that is something new to me………. It is nice to hear about your family memories and I loved it that you shared them with me………. Thank you for your very, nice comment………. At first you were associating Fasching with food only and I thought, “That’s not they way I remember it the two winters I spent in Germany.” But then I was in my mid twenties. I loved both the German beer and coffee. Always enjoy your remembrances of your childhood. Hi Barbara……..thank you for your comment……..it is so nice to hear from you!!!!!!!!!!! You know when one is a visitor one does not experience the food part as much as if you would have stayed in a family……and been a part of their Fasching. When I was researching KAFFEEHAUS, I was sure to be in Vienna during Fasching so I could experience Krapfen firsthand. On Fat Tuesday itself, my friend Karitas and I went all over town buying a couple of Krapfen at each Kondieterei–Aida, Oberlaa, Demel, Meinl’s glamorous supermarket, and more. We settled down with coffees at a cafe near the Naschmarkt, and shared our bounty with the waiters, and had a impromptu taste test. Soon, everyone in the room was weighing in. There no clear winner, but we had a lot of fun. I was taught to sandwich two rounds together with apricot preserves in the center before frying. Your version makes much sense. 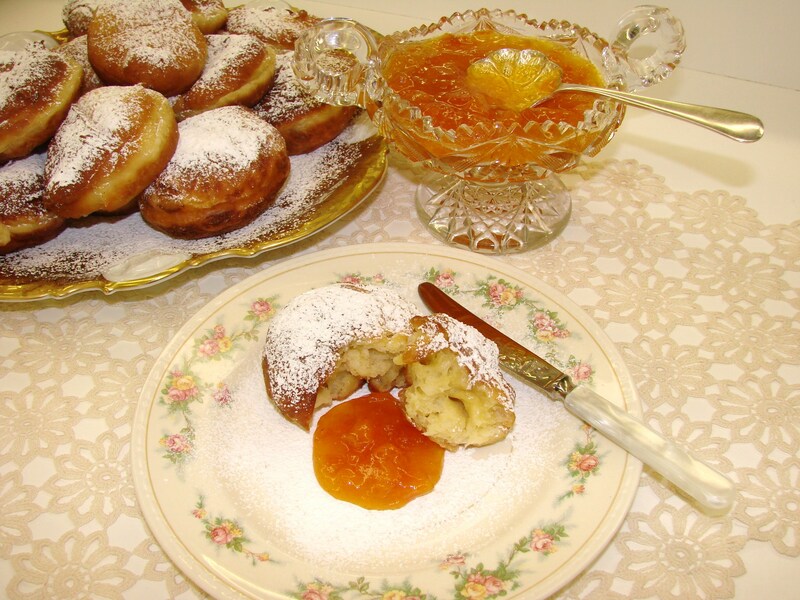 Of course, you could pipe the jam into the Krapfen if you want an professional look. When I wrote the book, it wasn’t easy to find Bismark tubes for the piping job, however they are now easily found online for a buck or two. Your site always makes me homesick for Vienna…even though I didn’t “live” there for more than a few weeks. My mother would tell me that her father would always shop at Meinl when he visited his sisters in Vienna……..and opening his packages when he returned home was always the most exiting time…….pulling out beautiful cookies covered with chocolate and chocolate bars and candy, chocolate covered candied orange rind…….fresh blood oranges and apples…….all in the winter just before Christmas…..
How the world has changed???????? Maria, what an absolutely wonderful and delicious recipe. The pictures and your article are also amazing! outstanding job! from – Elizabeth Wholey…………via email! Hi Maria, I love it when you write about your early life. And it sounded so yummy, I went out here in San Miguel de Allende and ate a wonderful doughnut! so nice to hear from you…….and that my story made you go out to get a Krapfe …….. I hope you enjoyed it……. If you should ever make this dough……it is much like a brioche dough……..
Continue having a nice time at St.Miguel de Alende………. Fasching in Germany. The Hungarians also have a tradition of having “costume balls” i.e. dances just before lent. As refugees in L.A. we went to several, even one that was hosted in the home of one of our friends. I remember I went as a dancehall girl, in a costume I made myself. I also bought a blond wig no less and false eyelashes! My husband went as a “miner 49-er” complete with beard, glasses, beat up hat, old shoes and a toy pistol borrowed from our boys. I still have our photo from that party. He danced with his sister and she did not even recognize him! Imagine that! Your recipe sounds great, except for the peanut oil, a no-no for our family since two of our boys and our daughter are severely allergic to peanuts in all of its forms. Perhaps I could substitue another oil? Which would you recommend? Hope your family is well and you will soon enjoy your grandkids again. 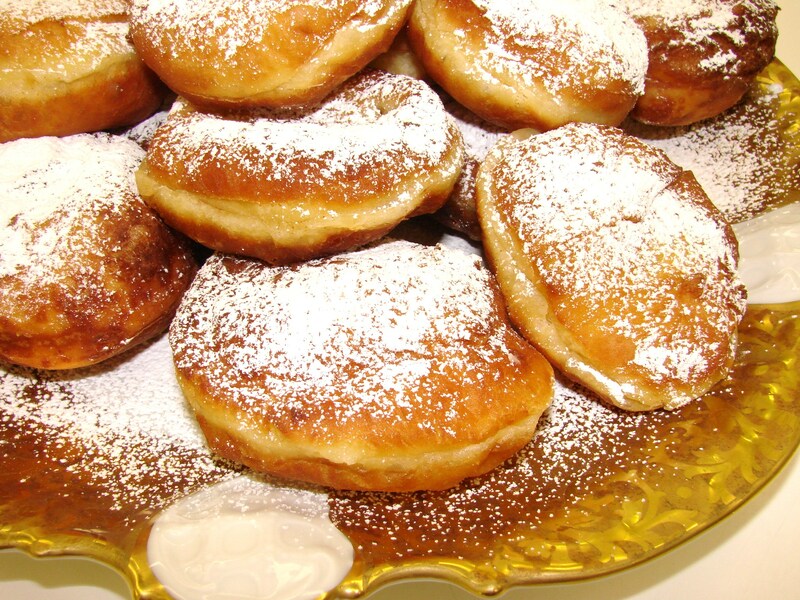 Hi Dora……..thank you for your interesting Fasching memories……..
About the Krapfen…….you can use Canola oil to supplement the peanut oil. 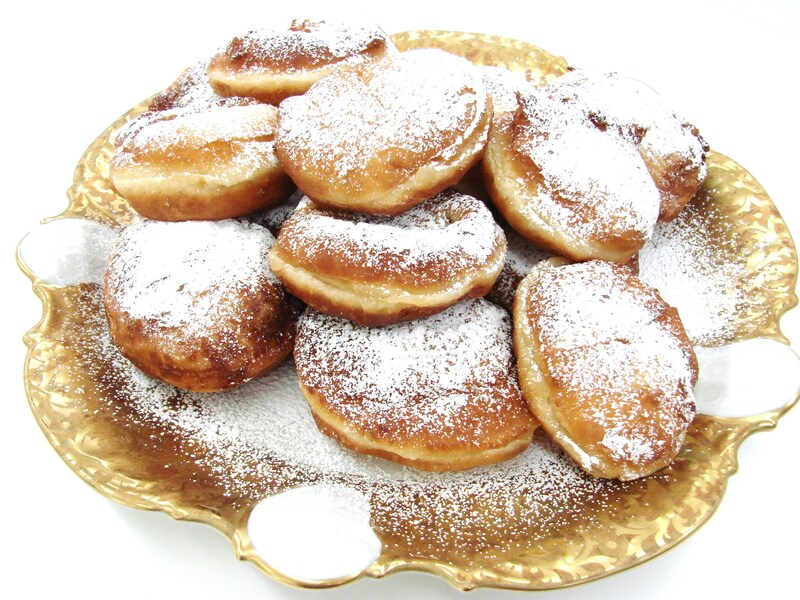 It is important to let the dough rise two to three times to make the Krapfen light in consistency……. Hi Maria, als Kinder hatten wir immer viel Spass um die Faschingszeit. Nach der Schule zogen wir uns um, gingen “Maschgara” im Dorf rum. Die groesseren Buben konnten recht ruppig werden. Meine Eltern hatten grossen Spass sich zu kostuemieren. Am FAschingsdiesntag gab’s einen Umzug im Dorf. Die Leiterwagen wurden von Pferden oder Ochsen gezogen und die Erwachsenen hatten grossen Spass. Ein Zimmermann war ein grossartiger Schnitzer und stellte hervorragende Masken her. Er schnitzte fuer uns die Koepfe, Haende und Fuesse fuer die Kasperfiguren. Wir hatten natuerlich den Kasperl, die Gretl, einen Koenig, einen Schutzmann, den Teufel und ein Krokodil. Die Spiele dachten wir uns selber aus. Meine Kinder hatten auch eine gute Auswahl von Kasperlfiguren. Ich benutzte sie dann wie ich unterrichtete. Eines Tages waren diese schoenen Figuren aus meinem Schrank gestohlen. Meine Kinder waren sehr traurig wie ich ihnen das mitteilen musste. Leider kennt man diese Art von Spielzeug hier kaum. natuerlich gibt es sie im Fernsehen, aber selten, dass die Kinder selbst sich was ausdenken. How very interesting. Thanks for sharing your stories of your life in Austria/Germany. Since my grandmother came from Austria, it is even of more interest to me. My mother made donuts every year, but the kind with a hole in the center……..delicious!!! Hi Linda………thank you for your comment…….. Thank you for sharing your childhood memories……..
Maria: your torte reminds me of the Smith Island Cakes, which have about 12 layers! Their recipe is past on from one generation to the next by the ladies of Smith Island. Best wishes to you and Dale! I too was surprised to see the torte was reminiscent of the Smith Island cake! I am available for comparision tasting anytime! Thank you so much for sharing this delicious recipe. You have such a beautiful way of putting your words into a story and making it so enjoyable to read. Thank you………….Laury………..such a sweet note……….I so appreciate your comment……….. I tasted my way through Vienna’s Faschingskrapfen. My favorite is Demel’s, followed closely by Diglas. All others paled in comparison, my tastebuds, of course. Hi Merisi……………so good to hear from you!!!!!!!!!!!! I too love these Fashingskrapfen….but I also love Punschkrapferln….I really need to make them this year…. Meine Mutti machte Punschkrapfen – meistens zu Weihnachten…. Hoffendlich horen wir von einander ein bischen ofter in the Zukunft…..